Erik and his girlfriend, Jennifer, wanted a dog and felt strongly that they should adopt one rather than buy one so as not to support puppy mills. With that decided, the Schaumburg, IL, couple turned to Petfinder and began their search. 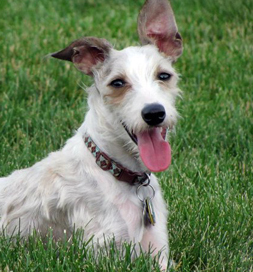 “To our surprise, we saw him; his name was Winston, and he was as unique as a unicorn,” an Italian Greyhound/Schnauzer mix – what they were looking for wrapped up in one cute package. Winston was at ROMP Italian Greyhound Rescue, Chicago, a group that does a thorough job of vetting potential adopters. The couple passed the first stage and then it was time for a home visit. When Winston arrived, the couple greeted him, and he clearly liked them and seemed to know this was to be his new family. Their careful preparations for him paved the way for getting approved for the adoption. “A few signatures later, it was official, we were a family,” Erik says. All signs say Winston made a good choice.